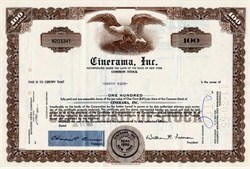 Beautifully engraved Stock Certificate from the Cinerama Corporation dated in the 1960's and 1970's. This historic document was printed by the Security - Columbian Banknote Company and has an ornate border around it with a vignette of an eagle spreading its wings. This item has the printed signatures of the company's officers including William R. Forman as President and is over 30 years old. Cinerama was in the business of producing and distributing wide screen motion pictures. In addition, they were the operator and owner of hotels in Hawaii and owner and operator of motion picture theatres on the West Coast. Their offices were located at 1345 Avenue of the Americas in New York. William Forman was a pioneer in the motion picture distribution business. He not only was a major contributor in Cinerama, he also was one of the founders in Robin International, Urban Drive-In Theatres and Pacific Theatres. Pacific Theatres is currently owned and managed by the Forman Family and includes the Gaslamp 15 in San Diego and the Cinerama Dome, a giant-screen geodesic dome and famous Hollywood landmark (under renovation) among other theatres. In addition, Pacific Theatres is a partner in a new Polish multiplex theater chain called Silver Screen, which currently operates one theater in Warsaw and has several more in development across Poland. It also owns and manages real estate through Pacific Theatres Realty. William Forman also produced, Krakatoa, East of Java. 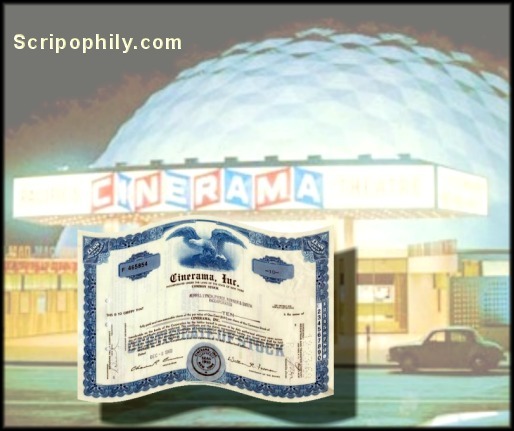 The first Cinerama theatrical releases were travelogue documentary adventures which became unparalleled box office hits even though they played in only a few exclusive road show locations. Their audience attendance rivaled and often surpassed those of the Hollywood films produced in that era. The first Cinerama production, This Is Cinerama played for only three months in one large Broadway theater and became the number one box office film hit of the entire year. Later, all but two of the Cinerama films that followed the first smash hit were listed within the top ten box office blockbusters of their year. Hollywood studios were taken aback by Cinerama's early successes and set their technical teams to develop wide screen systems of their own. Thus began an era of wide screen processes such as CinemaScope, VistaVision, Technirama, Superscope, which all were eventually dominated by Panavision. At the peak of the format's popularity there were over 230 theaters around the globe showing ten performances a week. In 1961 the first Cinerama productions to tell a story were produced by Cinerama, Inc. and Metro-Goldwyn-Mayer. They were The Wonderful World of the Brothers Grimm and How the West Was Won, the latter becoming the number one box office champ of 1962. However, due to the expense of conventional Hollywood production in the process, as well as the technical restrictions imposed on the filmmakers, the bottom line prevailed and How the West Was Won was the last true Cinerama feature. 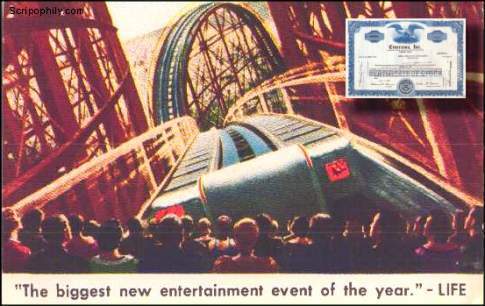 However, Cinerama lived on in a 70mm version at the exclusive Cinerama road show houses for over seven more years. The exhibition of classics like It's A Mad, Mad, Mad, Mad World, Grand Prix, and 2001, A Space Odyssey caused the familiar Cinerama name and logo to survive into the 1970's.